Bring the entire family to LS Fest – there’s something for everybody. Great food, beverages, and other activities will cap off what is sure to be one of the most exciting and memorable automotive weekends of the year! 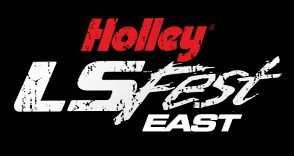 Who will be Holley’s LS Fest West Grand Champion? The driver or participant that can do the best all around job in multiple events! Bring a car that can go fast, stop fast, and hang on in the corners! See the official rules then show up and drive! Late Model Class: All 1990 and newer model year cars (including El Camino). Vintage Class: 1989 or older model year cars (including El Camino). Truck Class: All trucks regardless of the year of manufacture. *EDIT:For those curious, El Caminos will be classified as a car for this competition. They are not eligible for competition in the truck/SUV class. UPDATE: Since 2017, the Show-N-Shine component of our LS Fest Grand Champion competition has been eliminated. As such, Grand Champion competitors NO LONGER need to have their car judged to attain five bonus points to add to their total combined score. With the elimination of the bonus points for Show-N-Shine, the remaining Grand Champion points to be earned will come from competition in the autocross (at both Beech Bend Raceway AND NCM Motorsports Park), the 3S Challenge, and the Grand Champion drag class. One vehicle from LS Fest will receive an automatic invitation to compete in the prestigious Optima Ultimate Street Car Invitational! LSFest is an OUSCI open event, meaning we will choose a car to receive a complimentary entry into an OPTIMA Search for the Ultimate Street Car event of their choice either in 2019 or 2020, so they have a chance to win their way into the OUSCI! Listen up, Corvette owners! Here is another reason to have your ‘Vette in top running condition at LS Fest! Vette Magazine is proud to announce its special event during LS Fest which will recognize the “Fastest Corvette” in three categories: Drag Race, Autocross, and the Vette who puts up the highest output in the Dyno Challenge. The “Chevy High Noon Shootout” continues on at Holley LS Fest. The High Noon Shootout will offer two individual events throughout the weekend, including an autocross challenge at noon on Friday, and Chevy High Performance Best of Show at noon on Sunday for the Show-N-Shine. The winner of the Chevy High Noon Shootout will receive a $500 Holley Parts Gift Certificate.